In 2014, archaeologist working in the Macedonia region of Greece uncovered the largest ancient tomb to date. Preliminary analysis placed the Tumulus of Kasta Hill’s construction in the era of Alexander the Great, and many speculated the grand burial site belonged to the famed leader himself. TGNR followed the discovery closely until it was overshadowed by the Greek financial crisis and the Syrian refugee surge. Now, two years later, new evidence has surfaced and the story continues. Amphipolis, Greece – Earlier this year, lead archeologist Katerina Peristeri presented the most recent findings from the Kasta Hill excavation. She revealed inscriptions found on the structure’s blocks which bear the seal of Hephaestion, the renowned general and close associate of Alexander the Great. Peristeri proposed the massive tomb was a heroon or shrine to Hephaestion, possibly commissioned by Alexander. Fellow researcher Antonio Corso revealed fragments of a marble frieze found near the tomb. The warrior depicted in the frieze bears a distinctive helmet, hairstyle, and other sartorial hallmarks of a Macedonian soldier from the last quarter of the fourth century B.C. which is concurrent with the reign and demise of Alexander. 3D recreation of the tomb interior. The exciting artifacts presented at the annual scientific conference on archaeological work in Macedonia and Thrace (AEMTH) met with skepticism from fellow archaeologists. Historian Andrew Chugg argues that the stones were reused after Alexander’s death. Chugg also asserts that the monumental tomb actually belongs to Alexander’s mother, Olympias, whose age at death matches the approximate age of the female skeleton inside the burial. The other four individuals, including an infant, found at the site remain unidentified. August 2014: archeologists unveil the entrance and the first three interior rooms of tomb. The first doorway is topped with opposing sphinxes and two caryatids guard the passageway to the deeper chambers. October 2014: A beautiful floor mosaic is unearthed in the second chamber. Mostly intact, the scene depicts Hermes and the abduction of Persephone into the Underworld. 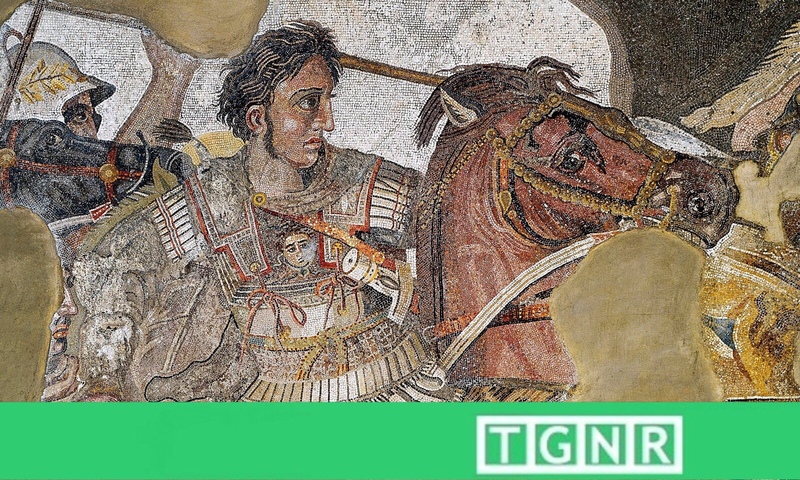 The style of the mosaic is in sync with the overall style of the tomb which researchers credit as the artistry of Dinocrates of Rhodes, Alexander’s court architect. January 2015: The Greek Minister of Culture announces that the remains of five individuals have been found in the tomb. One body was cremated. The remaining human bones belonged to two adult males (one who suffered violent wounds), an older adult female, and a newborn. Historians postulate these are the remains of Alexander’s immediate family including his mother, widow, son and half-brother who were murdered after his death.